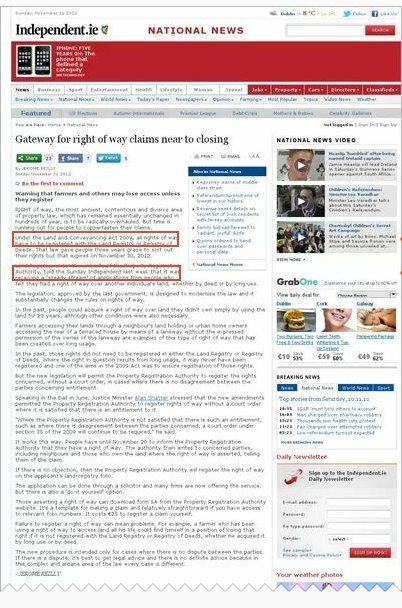 The Sunday Independent set the cat amongst the pigeons last weekend by reporting that the deadline for claiming a right of way established under the old rules (ie. the system in place before the Land Law Conveyancing and Reform Act 2009) was to expire at the end of the month. The article, which has since been removed from the Sindo website, also caused a lot of head scratching in the legal community and panicked phone calls from clients this week. People who might be entitled to register a right of way should still consult their solicitor but the deadline of 30 November 2012 was incorrect.